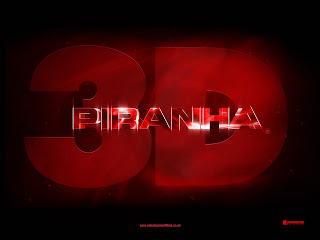 Great Expectations: Movie News: Sequel Planned For Piranha 3D! With Alexandre Aja's remake of Joe Dante's camp slasher Piranha hitting theatres last week, the film was welcomed with mixed reviews, but most were leaning more towards the positive. With comments such as, "the film delivers exactly what horror fans like...", "the violence is gory, gratuitous and convincingly staged..." and "those who go in craving blood, gore and breasts are going to leave the theatre with big, silly grins on their faces", it was only a matter of time before a sequel was announced, especially after the original received the same treatment - i'm pretty sure James Cameron won't be returning, however. Dimension Films was pleased to announce that Piranha 3D: The Sequel is in the works, despite a disappointing sixth place on this week's US Box Office. With a film made with such a minimal budget (compared to most others pegged by Dimension, anyway), a sequel to one of the goriest, outlandish and simply enjoyable films of the year would be welcomed with open arms. Expect a big-screen return of the razor-toothed prehistoric creatures some time in 2012. Read the review for the recently released Piranha 3D here!